Love Story: Letters from the Past is rated 4.0 out of 5 by 52. Rated 5 out of 5 by sirrap21 from Demo Experience The title caught my eye which lead me to check out the demo. So different than the dark, sometimes gritty mystery/suspense games I usually play but in a good way. Includes a fair amount of HOS with a tad bit of a twist to the norm. Not very challenging but what it lacks in challenge is made up for in art and story. A few of the scenes appear more cluttered, making it difficult to find the smaller items that are listed. 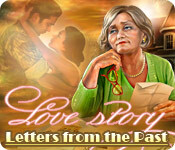 Love Story: Letter From the Past is a melachony telling with a nostaglic appeal. Help the character Mary tangle through the mystery behind her late husbands love letters he'd written in the past but for whatever reason they never made it into Mary's hand.....until now. Soon after the day of Mary's husbands funeral, Beth, the comly, loyal nurse whom had been taking care of John departs, but I believe she has alternative motives, however that's when my trial ended. This was a nice change in the usual BF genre of games. It's bittersweet as you help Mary navigate her new life without her loving husband John, while trying to figure out if the person she had trusted with her husband's care may have a dark side to her caring demeanor. Rated 5 out of 5 by qpqt from Charming Storyline, Relaxing Game I think this is my new favorite game. The graphics are bright and beautiful. You feel like you're in the house with Mary. The music is soothing. And the story is compelling, though guys probably wouldn't be interested. Pluses: The game is quite long. The Hint button recharges quickly. Though a walkthrough is available, it is not needed. You don't keep visiting the same rooms. It definitely would have been worth $9.99, but I got it with the $2.99 Blowout sale. When I play it next time, I am going to spend more time admiring the scenes and rooms and furnishings. Rated 5 out of 5 by AutismMom00 from Just a sweet, gentle game. Normally, I really enjoy the darker, more gothic stories, but I really enjoyed this one. Going back in time, seeing the story unfold, and feeling a part of history. This is a game I would let my kids play. My son would turn his nose up saying it was 'too girly' but I think my daughter would love it. Very tender, kind, and light. Something for a true hopeless romantic, or even for some of the younger generation of maybe a glimpse into great grandparents' timeframe. Rated 5 out of 5 by GrrlScientist from and now, for something entirely different! in this hidden object adventure, a grieving widow returns from her second husband's funeral and discovers a package in her mailbox. the package contains love letters that were written 30 years ago by her first husband, who had died during the war. as mary opens the box, a wind blows them all over the house, so she must find them. note that i mentioned this is an adventure game, too. even though the widow, mary, doesn't leave the house (well, in demo mode! 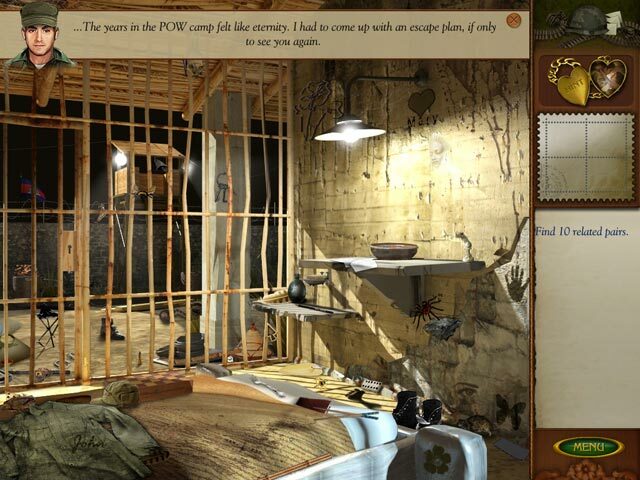 ), and even though no one dies or is kidnapped and there are no ghosts, demons or evil spirits lurking anywhere, this game is an adventure of the mind, where mary's POW husband's letters that detail his life and escape from his wartime captors are re-enacted as a series of interesting and captivating mini-games. i love this game because the developers wrote and designed it with a novelist's eye for detail, character and plot. everything about this game is absolutely outstanding; the beautiful graphics, the sophisticated music, the wonderful characters ... and this is one of the best, most realistically and carefully plotted video games i've EVER played. i think this video game (and its companion game, the beach cottage, which i plan to play next) define a whole new genre of video gaming, and i can hardly wait to see where this genre goes next! even though i only played this game on demo mode, it is MOST DEFINITELY on my purchase list. in short, it's clear that a lot of love and thought went into the creation of this game. i highly recommend love stories: letters from the past -- if for no other reason than so you can experience what another way of designing video games can be like. Rated 5 out of 5 by Amijane from Entertaining and engaging game! Haven't read real romance novels since teens, prefer fantasy and crime novels as an adult, but somehow the reviews and the urge do to do something different made me download this game for trial. Then came memorial day sale next day and I bought it (still untried, though I seldom do that) and was home alone one evening without hubby and kids and thought I'd give it a try. First scene had a Siamese cat in it and I was completely hooked (having 2 and knowing exactly why she kept so many spray bottles around the house) and the game was so engaging. No murders no supernaturals and still I couldn't wait for the next chapter! And to be honest being an old lady myself, trying to get out of a Cambodian prison actually gives me more shivers than any dark eerie fantasy game! Rated 5 out of 5 by HappyGrandma38 from I love love stories Very good relaxing and dreamful game. Something for tender souls. Rated 5 out of 5 by Aussienanagamer from JUST LOVELY!! A very 'nice' game. A great change from all the doom and gloom and ghosts and goblins themes of many of the HOGs. Thanks BigFish. Rated 5 out of 5 by happy7117 from This game was MADE for me! Or for any widow for that matter. To feel like a widow after your husband or lover leaves.and trying to put the peices back This game is heartbreaking! A woman who loses the love of her life and who lives alone. I practicaly could be the man in this story sending these letters though my name is not John. And Beth is the name of the best friend who I lost recently like the lady in the story. It's actualy frightening to see how my real lost love is doing through the lady in the story here. I can almost picture my lost love having a cluttered house--never answering the phone. Feeling trapped with no way out. With her man gone forever as a prisoner of war. And I took science as well. This game was sent by GOD. Rated 5 out of 5 by nataliegb from So cute! Romantic story line was great, it was mostly what kept me going through the game. Rated 5 out of 5 by queenvon from Great for the Over 50 HO gamers! Lovely game, sweet idea, ROMANTIC, good story line and well done HO scenes. None are just HO, though, all contained some objects that either had to be put together or required some other component from another scene before you could complete it. That was the worst part for me--having to continually go to another scene to get say, a screwdriver or a lightbulb so that you could fix something in order to see to find another item you needed. So every scene was 'but first go do ______", which became a little bit tedious and also a little confusing--you had to remember WHY you were doing this HO scene and what you needed to take back to which other scene/room! Other than that, the scenes were all well done, most objects fairly easily found. You must collect/find letters written to the woman featured in the story from the love of her life--a man she married before he was sent off to war...but no spoilers! The story was sweet, the HO scenes good, the ending nice! All in all a pretty solid game experience, especially for those of us eligible for AARP! Many hours of play, too. Rated 5 out of 5 by LoveIceCream from Romance No heavy lifting on this game just good entertainment. I play on my laptop while sitting on the sofa with my husband (he is watching TV). Togetherness! I am new to playing HOGs, but this is one of my favorites. The reasons are: The romance The storyline The ending The HOGs It was long enough for me In some of the scenes, I felt like I was there. For example ~ in the bedroom (where the hanger was sticking out from under the bed), the kitchen (with clutter on the table) and on the front porch. Simply marvelous. Rated 5 out of 5 by rainbowtree from Love Story: Letters from the Past Engaging storyline that kept my interest throughout the entire game. Wonderful graphics and soft music. 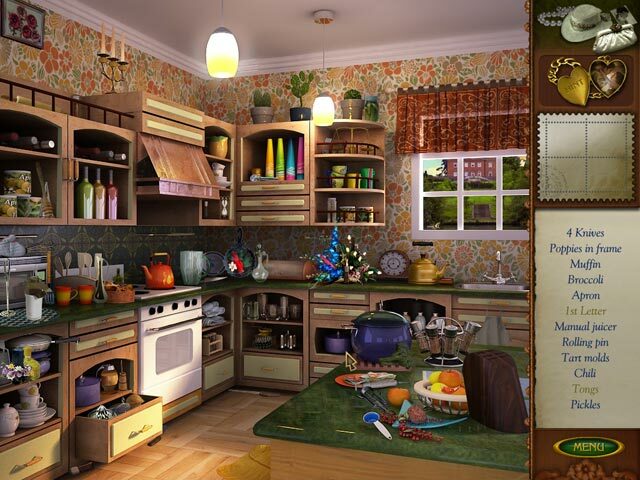 Relaxing game with a nice mixture of hidden object scenes and mini-games. A nice break from the many dark-themed games. Rated 5 out of 5 by gatoraid from Lovely game for the romantic soul I loved this game and didn't want to put it down. What a romantic and sweet story. Pleasant music and scenes. I was so excited to see "Love story the beach cottage". It is kind of another story but in the same vein as the first. Really pleasant and nice. Hope they come out with another one. Rated 5 out of 5 by tilmalene from Entertaining I love this game, very relaxing "feel good" game, and really a ladys game. Rated 5 out of 5 by margsha from One of the best Big Fish games I not played but also bought Again great story line, wonderful music. I would recommend this game to anyone. I loved the music. Great great game. Rated 4 out of 5 by gamefan10 from A lovely game This was a very sentimental game, telling the story of two lovers that were reunited after years of being apart. It's not very complicated, mostly hidden objects and mini-games. Sometimes the objects are very difficult to locate, but there is a quick-recharging hint system to help if needed. If you like a little romance, like finding hidden objects, and like proceeding through the game step by step in order to solve a mystery, then this game is for you. I really enjoyed it! Rated 4 out of 5 by AngelQueen36 from Romantic Loved the romantic storyline of the game. Rated 4 out of 5 by october090 from Love Letters from the past What an absolutely delightful and sweet love story, loved it. How now to see a story like this for a change, instead of something violent all the time. Lovely graphics and rather pleasing background music as well.. Some of the hidden items were a bit difficult to locate at times, but there is a hint that recharges pretty quickly. Kept on playing this one as I wanted to know how the story ended and did not want to wait. Rated 4 out of 5 by BecomingDesa from Not as Good as Beach Cottage, but still Satisfying I really loved the Love Story: Beach Cottage more but I think that is only because the ending was a little longer and rewarding. This one feels almost anticlimactic at the end and the resolution is way too short...disappointing. But I loved the music. The settings were also beautiful and fun with an added scrapbook feature that makes this game a little longer to play and that's nice. No puzzles of any kind, sort of a bummer. But overall I am happy I played this game, really liked it and beg Big Fish to make more in this series!!! Rated 4 out of 5 by LadyoftheIvy from A sweet game This is a very sweet, romantic game with a nice story. It's a happy-ending sort of game, and isn't really dark like many hidden object games out there. (Which is a plus for those out there who don't care for the darker ones.) 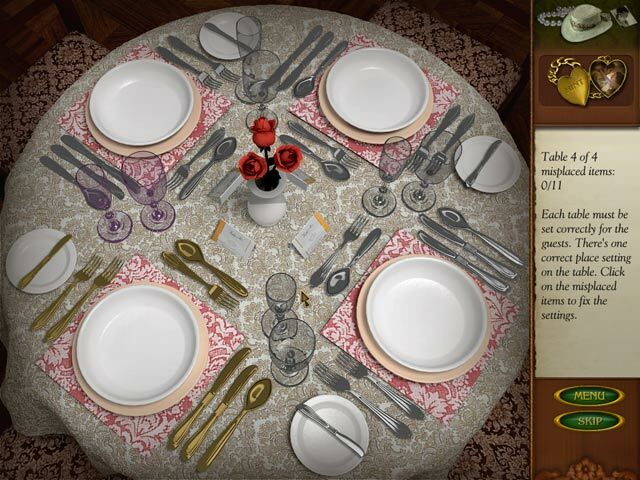 It also has a nice blend of hidden object scenes and mini games. That being said, it's not extremely challenging, but the story helps make up for the challenge this game lacks. The lack of challenge and the story make this a good game for someone who enjoys hidden object games but wants something more relaxing. The graphics and music are pleasant, and it's a nice length as well. Overall, it's a sweet, pleasant game that I'd recommend. Rated 4 out of 5 by sartasia from A gentle delight.. I thought this was a sweet story and I wanted to find out how it ended. I thought the mini-games were quite entertaining, varied and imaginative for such a gentle HOG. The game was not hard but not boring and had many more chapters than I expected. Was pleased to discover that finding the letters was only a quarter of the chapters and it continued on.The music was lovely and quite a surprise since there was not as much repetition as you find in most games. Not a really challenging game but sweet and relaxing. Rated 3 out of 5 by Mercime from Eye strain city I wonder who still has square monitor. The game aspects are made for old fashioned square monitors and lot of space that could have been used for the HO part. Story is sweet and sappy. If you like chick flicks, you will like it. No scary monsters, spiders and ghosts. Visual is clear and well done, BUT due to the aspect small and hard to see. Play it if you have large monitor. Luckily hint recharges fast. Would be nice if the developers would remake the game changing the aspects. Rated 3 out of 5 by CajunJuJu30 from Not too bad This game was ok for a HOG. The storyline was cute and sweet. It's not on my list of top-rated games but it's also not on my list of low-rating games. It was maybe a little in between, the graphics were good but not excellent the characters weren't really all that enjoyable but the served a purpose. Over all three stars is pretty good. Rated 3 out of 5 by Mickey107 from Too many HOS This is my first negative review. I wish when I'd read the reviews someone had mentioned that this was a HOS after HOS game. I would not have purchased it. It is boring. If you love HOS, buy it. If you like adventure, don't. Rated 3 out of 5 by JoannC2518 from Disappointed I almost bought this game, just because I loved the other two of this series and thought this would be similar. I have no doubt it is a lovely game, the story is sweet, the music pleasant -- but if the main character, Mary's, eyes are as bad as mine, she will still be looking for those letters for all of her remaining years. I found the HOPs simply too hard to see, too obscure, too well hidden to the point where I had to use the hint button most of the time and that spoils a lot of the fun. I would happily recommend this game to anyone who has excellent vision and lots of patience, but I'm afraid I'll have to pass on this one. Rated 3 out of 5 by SchoolMom from Love Letters from the Past ~ Touching Wow, Love Letters from the Past has the best hidden objects. The objects were truly well hidden and required me to use the hint button more than I am accustomed. :-/. Awesome graphics /picture quality of hidden object. This game has some of the best effects I have played during my short gaming period. Fantastic, wonderful! The storyline is cute but it lacked that extra spark needed to make the game a near obsession. Love Letters from the Past became dull after finding the first few notes. The challenge segments of the game were ok. Love Letters from the Past is great game for an audience who enjoys very calm, mature games that will not cause anxieties or restlessness. Enjoy!